Even though Kelly was replaced by Chelsea in 2011, the Club 5 Bunch sets are still a good find at garage sales or online. Charming, and much more realistic body shape than older sister, Barbie. Over and over again, we hear praise for Kelly and her friends. Looking more like the little girls they were intended for, Kelly dolls lack the exaggerated and unrealistic body shape that many people find inappropriate. 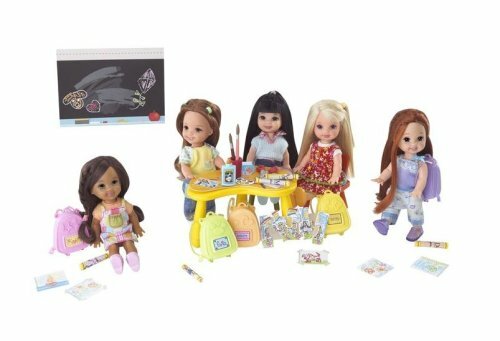 The Club 5 Bunch sets come with Kelly and four of her friends. The School Bunch includes Kelly, Kayla, Deidre, Melody, and Gia, but other sets may have a different friend selection. Though Kelly was discontinued in 2010 and replaced by Chelsea in 2011, the sets are still available from sellers online, such as Amazon. The Chelsea doll is not all the different from Kelly, and most kids won’t care about the name change or the slightly altered look. Club 5 Bunch sets (sometimes listed as Kelly Bunch Club 5, or Kelly Club Bunch 5) include Kelly and four of her friends, though different sets may have different friends. Each friend comes with her own little accessory, which changes depending on the set’s theme. Dolls measure 4 ½ inches tall. As with any doll, these encourage pretend, storytelling, and role playing, which all help improve a child’s ability to express themselves and learn social skills. As mentioned above, the Kelly doll was replaced by Chelsea in 2011. The body form used remains most the same, though Chelsea seems a smidge taller and has a rounder face with smaller eyes. Most kids won’t notice, though it did upset many collectors. The size of these dolls is just about perfect for little kids to carry around, and the feet and legs are pretty easy to stuff into a pocket for easy transport. Since these are no longer being produced, many online sellers will be selling them at collector’s prices. Grabbing them at a yard sale may prove a more reasonable move. For more tips on how to clean toys, check out our Cleaning Guide for Toys. Each Kelly Bunch set comes with Kelly, four of her friends, and accessories particular to that theme. As stated above, some people prefer to avoid the Barbie line entirely, as it has not been known to show realistic portrayals of women’s bodies, and arguably limits little girls on what they should aspire to be. We’ve found the Kelly dolls to be a much better alternative than her older sister, as they are fun, charming, and much more appropriate for children. We were unable to locate the manufacturer's description as these are no longer in production.